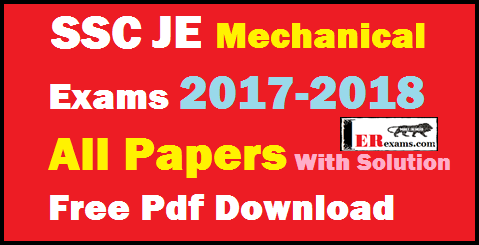 SSC JE Mechanical Exams 2017-2018 All Papers Free Pdf Download. This article provide SSC Junior Engineer Mechanical Exam all previous years Papers with solution 2017 and 2018 with free pdf download. If you are preparing SSC JE exam 2019 and searching SSC JE Mechanical Previous Years Papers 2013-2018 With Solution and Free Pdf Download this article provide all SSC JE papers. Mechanical engineering last year SSC (staff selection exams) JE Exam conduct in 22-29 January 2018 ,This article provide SSC JE all papers January 2018 papers with solution free pdf download. This article also provide you SSC Junior Engineer Exam old Previous Year Papers 2013 to 2017 with solution free pdf download. From the below table links, candidate who are preparing SSC JE Exam 2019 can download SSC Jr Engineer 2013-2018 Solved Papers with Answers PDF. Below table provide you The Staff Selection Commission JE Exam all Paper I 2013-2018 and some Papers II which are helpful for SSC JE paper-2 exam preparations. Download SSC JE Question Paper from the provided link. Below table provide you Mechanical engineering year 2018 SSC (staff selection exams) JE Exam conduct in 22-29 January 2018 all papers with Solution download. All papers here provide collect in Engineering Adda blog. Thanks to engineering Adda which are provide these useful papers. Below table provide you Mechanical engineering year 2018 SSC (staff selection exams) JE Exam conduct in 22-29 January 2018 all papers with Solution download. All papers here provide collect in Mechanical Forum blog. Thanks to Mechanical Forum which are provide these useful papers. Below table provide you Mechanical engineering previous Years all SSC (staff selection exams) JE Exam all papers and sample papers with Solution download. All papers here provide collect in Forum and blogs. Thanks to Forum and blogs which are provide these useful papers. Every year SSC conduct junior engineer exams for electrical, mechanical, civil branch students. My all website visitor knows that Engineering Exams website provide you effective study material which are help to crack your SSC JE exam. SSC JE previous years papers solving it’s a god habit and revision your exams preparation. Please solve all papers SSC JE mechanical exams 2017-2018 it’s defiantly helpful for crack SSC junior engineering exam 2019. If you find this post helpful for your SSC JE 2019 exam preparation please share with your all friends. If you face any problem to download any file comment below. You also ask any question about SSC JE exam 2019 below comment section.